Why would someone with Olympic Gold medal, world record and world championship level coaching credentials feel so strongly about the challenges of working with swimming parents? It should be relatively straight forward: coaches coach; swimmers swim, parents parent. Not that all that complicated really. This is not a thesis on thermodynamics – it’s just three groups of people working together to achieve a common goal – to help a swimmer realise their full potential. So why is it that so many coaches will tell you that their biggest problem – the greatest challenge they face – is not finding pool space or identifying talented swimmers or battling bad weather or being able to buy the latest and greatest swimming training equipment: it’s working with difficult and sometimes destructive swimming parents? 1. Doing it all for their kids. Confidence is the essential ingredient in all great swimming success stories. Confidence comes from knowing: i.e. knowing you can do it. Swimming parents think they’re helping by doing all the little things for their kids but the parents who pack their child’s swimming bag, empty it for them, make their breakfast, carry their swim gear, fill their water bottles etc. are doing the exact opposite. They are creating dependent swimmers – instead of independent young people and that’s not going to result in developing teenagers who possess a strong sense of confidence, self-belief, resilience and self-reliance. 2. Insist on coaching their kids in technical areas. Coaches coach. Parents parent. That’s it. It’s that simple. Coaches help swimmers develop things like physical skills, technical skills, turns, dives, starts, finishes, kicking, pulling – all that stuff. Swimming parents help their children learn values and virtues and help their children to develop the positive character traits that will sustain them throughout their lives. If everyone stays focused on doing their job well – everyone wins – particularly the swimmer. 3. Listen to other parents talk about technical issues. Swimming parents listening to other swimming parents about technical issues really annoys coaches. For example: “My friend, Susie, whose child swims at another program told me that they do a lot more breaststroke than we do. Can we start doing a lot more breaststroke?” Coaches spend years learning how to write programs, how to enhance swimming skills, how to improve stroke technique and how to build an effective training environment. Unless “Susie” has the same skills, experience, knowledge and commitment to coaching, it is unlikely her opinions on technical matters are as valid as the coach’s. Sitting on the side of another pool, watching training from a distance (and let’s face it – parents only really watch their own child anyway), then making assumptions to apply to all swimmers at all pools is so ludicrous it is incredible that it happens at all. Yet – for some reason – some swimming parents find it necessary to listen to the views of people who have no idea what they’re talking about rather than have faith and trust in their child’s highly trained and experienced professional coach. Want to know why swimming parents are banned from so many pools around the world – Gossip. Coaches hate those little groups of swimming parents who sit together comparing “John’s freestyle technique” to “Mary’s freestyle technique” and then criticise the coach because neither child swims as fast as Michael Phelps, even though they’re only six years old and train once a month. Got a problem with the coach – go to the source and talk to the coach – not to other swimming parents. 5. Talk swimming all the time to their kids. We all love this sport. But it’s just a sport. There are movies, art, music, politics, literature, theatre, other sports, rest time, going to the beach, hiking, learning another language…..the world is full of millions of wonderful experiences and children need the opportunity to be exposed to as many of them as possible. There is no need to talk swimming all the time. All it will do it increase the likelihood that the child will walk away from the sport in their mid teens and frankly – this “teenage retirement” syndrome is a worldwide swimming epidemic that we all have to work together and try to stop. 6. Expect PRs every time their child swims. No one swims PRs every time they swim. No one. Re-read this line ten times. No one. Coaches cringe when swimming parents approach them saying “Steve didn’t do a PR in his butterfly today – what’s wrong? What’s the problem?” The child might have done a PR is seven other events, have done five football practices through the week and sat for four school exams but because they didn’t do a PR in one event, there’s a problem?! Trust in the coach to do his or her job. Coaches design and develop their program structures with a lot of thought, research and experience behind it. This long-term development pathway concept has its roots in mainstream education. For example, children aged 5 are introduced to basic mathematics at school. When they turn 8 years of age, they are exposed to long division. When they’re 15 they can do trigonometry, calculus and advanced geometry. Similarly, there’s a logical, purposeful process of developing athletes from learning to swim their first stroke to being able to win a national swimming title. Swimming parents who try to force coaches to push their kids ahead to the next level of development before they’re ready, are not helping the child (or the coach). 8. Give race instructions to their kids. Just don’t do it. No need to comment further on this – just don’t. 9. Treat their children according to their child’s swimming performances. This happens everywhere in the world and for some reason some swimming parents just don’t get it. Child wins – love them with all your heart. Child loses – love them with all your heart. Child does ten PRs – love and support them unconditionally. Child doesn’t do a PR for six months – love and support them unconditionally. How fast a child swims should have no bearing on how they are treated, spoken to or loved. When it comes to loving and supporting your child – particularly in public – winning and losing make no difference. 10. Try to talk to the coach on deck during workouts. There’s a really good reason why coaches don’t like this. Safety. If a coach turns their head to talk to a swimming parent about “Billy’s backstroke turns” or “Jenny’s butterfly splits” and there’s a safety issue in the pool, the coach is legally responsible and liable. Put it another way, if another swimming parent was talking with the coach on deck during workout and that meant your own child’s safety was compromised, how would you feel? When coaches, swimmers and swimming parents work together as partners in performance – 100% committed and focused on helping the swimmer to realise their full potential, amazing – incredible things are not only possible – but inevitable. A positive, constructive, successful swimming program is very possible when swimmers, coaches and swimming parents work together honestly, respectfully and with integrity. Nice we should post on our site. BTW, Paul talks to me..hehehe giving me work.. I like the technical conversation bits and pieces. If you have access to a coach [that is not your team coach] that can improve an athletes performance, and they teach skills and techniques your coach doesn’t teach, everyone can learn from the experience. If a coach doesn’t believe he/she can learn from anything new from another coach , they probably need to find something else to do. It is an exciting sport with new and improved training techniques, The sport has been around for decades, with new records posted regularly. I’m sure coaches do learn from other coaches/coaching techniques but they inform how they develop their programmes and should not be just thrown in the mix when they come along. Parents a) generally don’t really know what they are talking about and so their comments are unhelpful and b) if they do I’m sure they would discuss things in a constructive way with their child’s coach. I have been a golf pupil for a long time and the time my game went to pot was when I tried to get advice from everywhere rather than let my coach concentrate on the things that would build my game. And as we all know less than 1% will go on to be a significant force in any sport. So let the coach coach. Can we add in the parents that walk the pool deck at practice using stopwatch on all the kids? It’s PRACTICE people! Let the kids be!! That includes the ones videotaping from the stands during practice, too. This is also an invasion of privacy of the other swimmers. I remember reading that Missy Franklin’s mother packed her bag for her until she went off to college. It might even have been a ‘Swimming World’ article. While most of these make sense, a little extra support for a HS athlete who has multiple AP courses, and spends most of their time either in the water or studying would seem to make some sense. Oh stop it! firstly, the parents will learn. secondly, in most venues you cannot hear what the parents on the bleachers are screaming? let them scream! I work on deck at almost every meet I attend and the screaming is just noise. Parents invest time and money in watching their swimmers progress, banning parents is just a silly idea. Our club kicked a guy out for doing exactly that. While I concur with most of Wayne’s observations and I hate to be critical of my fellow coaches, there are a huge number of coaches who, knowingly or otherwise, hurt our sport as much as the parents AND they don’t have a clue they are contributing to the dismal 40% retention at the age group level. – Only the very good coaches put much thought into training. Unfortunately, most of our swim coaches from age group to club to college really don’t have a clue about setting up a season with a long term perspective. They coach the way they were coaches and often did not get much past “B” times. 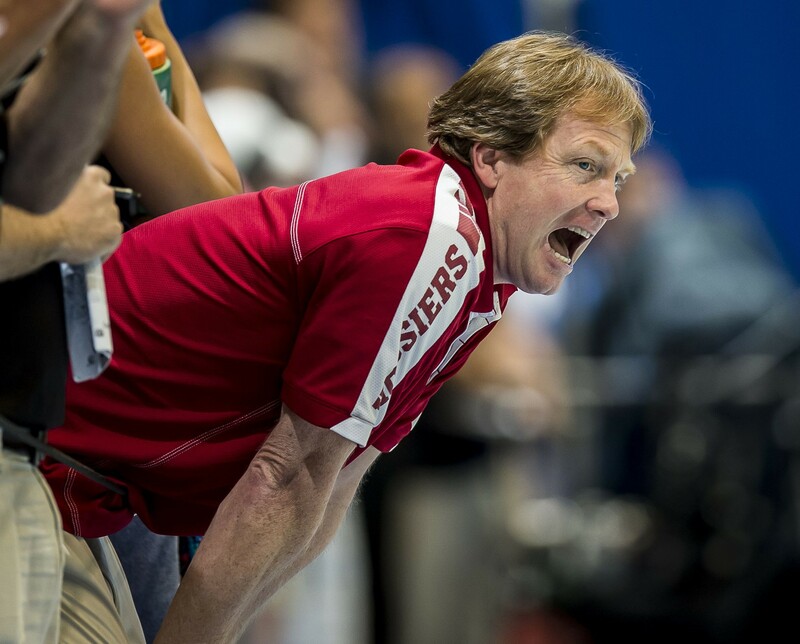 – Most coaches react to swims the same way parents do. If the athlete does well, they are all smiles. If they do poorly, they are frowny faced. Kids figure that out pretty fast. As a former swimmer, swim instructor, swim coach, and swim parent, I am tired of reading articles about how parents should leave all coaching to the coach. There are a lot of exhausting parents out there. There are some CRAZY swim/soccer/baseball/academic parents out there too! On the other hand, there are some incompetent coaches and instructors out there who do not always know what they are doing. Sometimes coaches are bad because they are inexperienced; sometimes they are just inadequate; sometimes they are overworked; sometimes they are just bad coaches. Not all professional coaches are professionals. Some just sort of stumble into the work as a job to do while they are at a crossroad in life. Articles such as the one above can be helpful, but can also overstep their boundary in telling parents how to parent. Should a parent blindly drop their child off at a pool to be coached by a coach who is inadequate? Should a parent not help a child to fill in gaps in a coach’s weak area? I am not condoning crazy behavior (of course, the definition of crazy behavior varies), but I don’t think a ban on parenting and looking after the welfare of a child is in the swimmer’s best interest. Every now and again, parents of swimmers give insight to the swimmer one might not have gotten orherwise. Why don’t we- coaches, swimmers, and parents, try working together? Absolutely agree with you. This article has many good points but it’s the zero tolerance vibe I get from it that’s turning me off. Some parents are crazy. Practically psychotic. But others can be an asset to a coach. We are not all the enemy. Agree. Just because a coach was a champion swimmer, does not necessarily make him/her a great coach just yet. Some coaches know little about child development and don’t have their own kids for first-hand experience of the whole child (in and out of the pool – they are not just swimmers, they are kids too). Also, the coach was likely very successful as an athlete; do they know how it feels to be a late developer or how to work thru the ups and downs of swimming (many coaches will ignore kids on their down periods and focus on other top or up&coming swimmers but this is a time the athlete needs MORE coaching, not less). 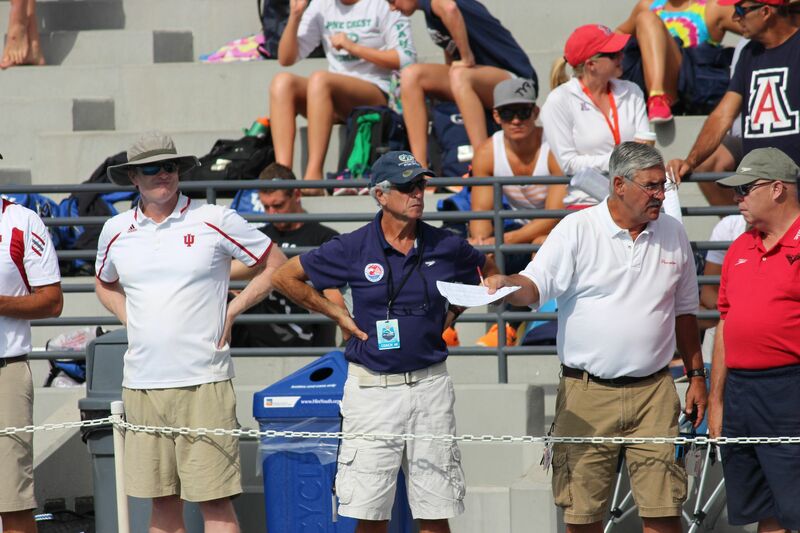 #4 – the gossip isn’t usually directed toward the coach…it’s usually about other kids or other swim parents. # 6 – so true. NO ONE gets a PR every time they swim. And agree with a lot of what Paul says above, having observed a coach that yelled/yelled/yelled constantly, putting the fear in his swimmers. They all do well until about 14 since they are pushed so hard…it’s after that they start sinking. What you describe is not unique to swimming, but all youth sports. Each sport needs better development of coaches, and parents need to learn that too. Sometimes a person can learn the technical aspects of a sport but can’t teach it well, and can’t inspire any age group to learn it. The same applies to constructing teaching. training sessions. Others do, and yet are criticized for it as the misplaced goal of development sometimes gets lost with youth and performance winning is substituted. Kids figure it out pretty quick by watching their friends/competitors reactions, coaches reactions and all the parents reactions. My two cents after 50+ years in the sport of swimming, with side trips to handball, and triathlon, and two kids who went through several youth sports and high school sports, and one grandson old enough to “try out youth sports”…we need to demand better trained coaches, as parents pay for it, and let our kids enjoy the sport with our full unconditional support, no matter the outcome on field of play or pool. I’d rather have a well-adjusted adult that loved their youth sports experience than someone who spends their life recovering from it, the coach, and me as parent…or grandparent. Glad I don’t do ANY of these. Love swim, but know my place!! I completely agree with the 10 listed and perhaps guilty of one or two! The one important comment I want to make is; parents spend a lot of time and money on swimming. It is a major commitment for every swim family. Many coaches understand that; but unfortunately many do not. I suspect the good coaches, whom have passion for the sport and their swimmers have very little issues with the above. Can I say, as much as we like to think we don’t, sometimes we do, as long as we as parents are aware then we can change. I don’t do any of these! Wheeew! Hi everyone – as usual anything I write about swimming and parenting ignites passionate discussion. Couldn’t help myself from adding something. The comments here about some coaches are well founded. Hopefully we’re moving on as a sport and those coaches who feel that pushing young swimmers up and down a lane for hours and hours doing mindless mediocre miles is a good idea are in the minority. Having traveled extensively for 25 years, the “drop-out” rate is a serious problem all over the world. Every major swimming nation is addressing the issue and considering the best way to combat it. In some nations – including Australia – the number of registered competitive swimmers is way way down from where they were in the mid 90s – and they continue to fall. The swimming nations look at marketing, advertising, promotional campaigns and a range of other potential solutions but most fail to address the most important issue – coaching. Coaches are the “shop-front” of the sport. They are often the first – (and last) – impression of the sport of swimming. They are the driving force of the day to day delivery of the sport: they are on the sport’s “front line”. In the “old days”, as I am fond of telling my own swimmers and children (I have four), coaches would rely on physical preparation alone as their “weapon” of choice and the sport became one of attrition and an uncompromising commitment to hard work. That’s all we knew. There was no other way. Now, (thankfully) we understand that performance is multi-disciplinary and that psychology, technique, skills, attitudes, recovery, values, character, tactical skills, nutrition and other factors – including appropriate parental support – all play vitally important roles in helping swimmers to realise their full potential. As Bob Bowman, coach of Michael Phelps said last year, “It used to be a matter of how many miles we could do and not break down. Now it’s what’s the least amount of training we can do but still win”. I think – and I hope – that we are entering a new age in swimming coaching where “passion” replaces “pushing”, where “inspiration” replaces “insult” and where technique instruction, skill development, engagement and enjoyment matter more than lap counting and mile-measuring. I have a lot of faith in the people who are at “coal-face” – that swimmers, parents and coaches can work together to create highly effective, engaging and enjoyable experiences for swimmers of all ages and levels of ability but it means letting go of some of the limited thinking and questionable behaviors that have limited our capacity to progress in the past. Someone who would have made a great swimming coach once said, “Change is the law of life. And those who look only to the past or present are certain to miss the future” (JFK). Thanks again for reading and for contributing to the discussion. Well said Sir! I am a Grandparent & observe my Granddaughter’s progress with complete amazement at her ability to keep on keeping on! Sport is expensive & coaches do need to consider that parents expect them to train accordingly. Parents need to remember that kids are not machines & if driven too hard too early will turn off when puberty hits. Tread carefully! I personally love watching these kids succeed & progress but worry at the same time if it is the best thing. They do need down time! Coleen Lively…I love this list! I know your kids swim so I am forwarding it to you! Haha! I can actually say I do none of these but I agree it is totally annoying-especially the gossipers. Quit talking about everyone else’s kids and go away!! I am my kids main coach so it’s hard to avoid all of those. Disagree. depending upon the age group, parents need to do these things for children until they are ready to do it for themselves. Not always. When you have a coach who only focuses on his/her favorites, the ones that might add points to USA Swimming status, or a chance at Olympic fame, and ignores the rest, a dedicated parent with insight to new techniques should be welcome. Parents who are more engaged than the team coach can tell you many things about how to help your swimmer improve. The article assumes all coaches are highly trained and experienced professional coaches. Sorry but there are many who are not. Whatever! Many coaches will not give you the time of day if your idea or question isn’t in line with their plan. How about sharing your plan with the parents? Don’t want to put it in writing or commit because it will change when you least expect it to. Our kids walk through the museum in streamline form. If the swimmers are thinking about swimming, talk about swimming. If they are thinking about music, talk about music. This comment may be from a person who is not a parent of a swimmer who is also a musician and who love to fish. When a coach announces for example that swimmers will not move up due to capacity, or does not have a predefined age group progression, parents absolutely have the right to speak up about why their swimmer who (through statistics) should be in the next group is not moved or aged up. Really? If your coach is on deck and doesn’t get out of his/her chair to coach their swimmers, someone needs to do the job. Prefer the parent over the coach of another team. Wish our coaches followed this rule. Cursing at the swimmer in practice or at a meet should require immediate separation yet many clubs allow it, especially with older swimmers. When the coach has issued orders to swim x number of sets (watched touch the wall too many times) and is texting and face-booking on their cellphone, that is a perfect time to get their attention. You are a coach’s nightmare parent! This is what I love about swimming….coaches coach, doesn’t matter who the swimmer is or the team the swimmer is on. If a swimmer needs a coach, the coach will coach. LIke all things, I guess, not all coaches are as neutral as the ones we have come into contact with. If swimming is your life. I would suggest to get a life. I would hate to be your daughters’ swim coach! Couldn’t agree more with #4 and #7. Many coaches do just play favorites and only pay attention to the star swimmers. And not every family has other programs available nearby. I am the ideal parent- I drop her off and pick her up! Ugh! So true! And it’s even more fun when the coaches have to fill out an incident report for the police about one swim parent attacking another during practice! Ok thats all right…..But there is also the 10 things Coaches do that parents cant stand. Parents have to get then out if the door in time to meet the days schedules so therefore if it works to sock bags and also get them ready for school next morning way not – I do it a few times a week for my two and guess what they are A students !!! Coaches know better than anyone , no need for extra critique , swim camps , new learning or possible areas of imotivrnt spotted by parents or supported by parents . always room to learn . Patents foot the bills , monthly fees , meet entries hotels food , kit they are the customer and therefore expect a level of services. The way parents are viewed by parents is not actual swimmereally in line with this is it ? I wonder if it was added up an annual cost why it would be deemed unreasonable to want results , improvement and regardless if level if success celebrate that ALL parties have achieved that SWimmer , coach and parents . So if coaches stopped writing and saying how much they dislike patents perhaps the funding , support and assist what might be more valued ! And when I was teaching beginners and all the Mums sat there + chatted away when they were supposed to be helping or at least watching their little babes but they were talking so loud I sent them all out as they were distracting + kids could concentrate without them there!!!!! As a Head Coach who has experienced all of the above I feel that the key is not alienate parents but to educate them. Yes granted it is sometimes a lost cause but 99% of the time these problems are borne from ignorance not malice. Coaches can also learn a lot from parents so it needs to be a 3 way process, between Coach, Swimmer and Parent. If we all educate each other, we win in one way or another! Indeed – education is key. Yes…parents of fast developers often think — because when young their kid got a best time EVERY race — that this will continue forever. Sorry, but when your kid plateaus — and this is WHEN not IF — ALL fast developers hit plateaus — and other kids catch up, you can shut up now with the bragging and let the later developers shine. I’ve seen too many fast developers having tantrums in the 11-13 range, before they mature and “get it”. And the parents eventually “get it” too, but sometimes that is after a year of their kid crying. This should be posted on the bulletin board at our pool! Should be posted at every pool!! As a former D1 swimmer, coach, and parent I’m creeped out by parents who make their kid’s swimming their life. Kids should own their sport. Parents should be supportive – not take excessive personal pride from their kids’ accomplishments or get personally affronted by their kids’ failures. If a parent is that competitive they should find some way to compete themselves and not expect to live out their competitive fantasies through their kids. AMEN. Parents who live their lives vicariously through their children ruin sports for their kids and often irreparably damage their relationships. I’ve seen this in many sports — football, baseball, hockey, swimming, you name it — and it just has gotten crazier over the years. You can’t tell these parents to back off, though. They just don’t want to hear it. I’m grateful that my parents gave me the space to find my own way in swimming and life in general. I loced the sport as a kid and still do masters swimming today. Alleluia…. First step to these people’s recovery is to look in the mirror and say yes this is me! Cindy Frederick how do you do it? After being a swimmer, teaching lessons and coaching for a short period of time, I’m don’t think I could stop myself from doing some of these. Good thing my kids are not swimmers. I used to coach a basketball team full of kids whose parents were never around . In 10 years of coaching I had more kids without parents showing up than those that showed up . I became their coach , mentor and parent at times . While I loved my players I would have traded in too involved parents for uninvolved anyway . All swim programs have their strengths and weaknesses. One weakness of my sons’ team is that they don’t work with the kids enough on improving their technique. I’m not going to be able to change this about the program. But, I’m also not going to yank them off the team because the program has many good qualities and they like swimming there. Instead, I do what I can to help them improve their technique. If the coaches don’t like that, then too bad. What happens when the coach and parent are one in the same? Sit on a pool bench for a hour during practice, texting. Only pay attention to the one fast kid. Treat swimmers like their personal funding units (FU), not like developing athletes. Show up just in time, write a practice while the swimmers are waiting, and then talk about ‘the plan’. 6) Coaches believing that parents and swimmers exist to serve them. 2) Coaches setting a great example of how people can be stereotyped. What is next? Racial profiling? 1) Coaches being gullible enough to believe that that a derogatory list about parents helps them train better swimmers. Congratulations! You just pissed a bunch of parents off! Maybe you should work with the parents and educate them rather than generalizing and publically reprimanding them. I am sure that out of all the thousands of parents supporting swimming, this verbal flogging only applies to a small subset of individuals. Maybe you should let USA Swimming take the lead given your lack of perspective. Parents are not perfect, but coaches can be just as bad. Coaches need to remember that you are providing a service to the swim community and you ultimately need parent support and participation. Swimmers and Parents are the customer not the other way around. The arrogance and stupidity of writing a list like this will not make people behave better but rather make a sport that we all love a miserable experience. Furthermore, I am sure the parents described in the article are very supportive of their child, want and demand the best for their swimmer, and want to be part of their swim journey. And why should parents not be part of the swim experience? Parents have to get up at 5 am to get swimmers to practice and / or swim meets, parents pay for the training, and parents deal with all the emotional ups and downs of the swimmers performance and coaching commentaries. Oh, and by the way who are all the people volunteering at concession stands, timing, and making sure coaches are fed during swim meets? PARENTS that’s who! One more thing, who cares who packs the swim bag and who gets their kid water. Considering my kid is doing more in school today than what most adults did when they were that age, I believe my kid has earned a bit of consideration. God knows coaches are not the most considerate individuals. Coaches, be careful who you throw stones at because you are not perfect either. At last! You literally took the words out of my mouth! My children’s swimming club has just posted this article on their facebook page! How does that inspire anyone? How would the coaches feel if we posted 10 things we hate about swimming coaches on the club facebook page. They would be outraged! Firstly we wouldn’t do it as it would just be dam right rude and secondly it wouldn’t achieve anything but animosity, so why do it? I think that parents should have a right to reply in the Swimming World Magazine and Art’s response should be used as its the perfect response! I run few website business’s and I would never post on my facebook page or blog “10 things I hate about my customers”. It would be an really stupid thing to do! There are better ways to do this! Should be given to every parent at the beginning of each year!!!! Some enterprising swimmers should put one list on front of t-shirt, other list on back and market the heck out of the t-shirt! Make a great team fundraiser. Hey Derek Taylor my parents used to always do most of those! must have annoyed you to no end…. Chuckles to himself… yeah your parents both thought that they could coach. (one out of two ain’t bad)… don’t tell mum! I think every person alive who work with humans, as customers, clients, patients, or students would love to list the ten things that would make their job easier. In my opinion, if you are going into coaching, you need to overcome your obstacles. The parents are providing the funds that keep you with a job, so deal with it like the rest of society that work with people do. A good coach wouldn’t need to make a list, he/she would be able to handle the situation with subtle respect and dignity. Just sayin, it’s not a perfect world, might bee a good idea not to bite the hand that feeds you. Good article for discussion – as seen by the other comments. Like everything – finding that balance to support the swimmer, both on the parent side of things, as well as the coach is a critical.